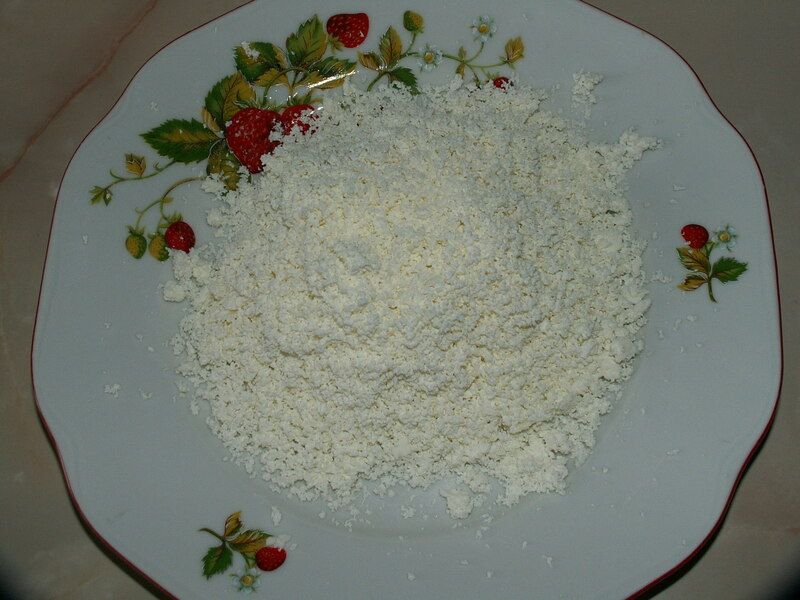 and for the sweet and most known type – powder sugar, ground poppy seeds, and some of that melted butter. Peel the potatoes, cut them (it can be in half, it can be into bigger pieces), pour enough water onto them so they’re under the level of it, add about a small teaspoon of salt (really, that’s up to you and the salt you use) and put it to boil. When almost done, pour away (but don’t throw!) the water. Take the flour and powder your potatoes in a pot with them, shake well so it gets in and around – you can also make holes in the potato filled pot with a wooden spoon turned upside down to make sure the flour gets nicely in. Pour a little of the water you stored away back (150ml? Same amount of spoons as flour? Opinions differ,) and cover it with lid, and on very low flame let the flour get steamed for around 20 minutes. You should be able to mix it with wooden spoon (or optionally mash with the potato gadget kitchenware) into a quite smooth, not-much-sticky mass (if it is too sticky, you might’ve used too fine flour, or might just wanna steam away a little bit more of the humidity). You than take your spoon and dip it into freshly melted butter and cut away with it chunks of that potato matter on your dish. The butter is what makes sure you don’t get it stuck on spoon. After that feel free to serve with few spoons of ground poppy seeds and sugar and a spoon of butter poured over it, or in any other earlier mentioned variant – your fantasy is your playground. You can also dry fry the stuff or some folks use lard to fry on, and serve it afterwards. And if it didn’t come out as you expected? Well, it’s cheap, you can try again or throw that idea out of the window completely.